"Emoji Finder" is a light-weight cross-browser extension to find and generate a list of Emojis. The toolbar panel allows you to easily find Emojis based on either their category or through tags using the search box. You can insert multiple Emojis or Emojis and text content in the editor box and copy the entire content for being used in any HTML5 compatible text field like on GitHub, Faceebook, or Basecamp's comment section. The extension remembers the recent list of used Emojis for later easy access. What is "Emoji Finder" extension and how does it work? "Emoji Finder" add-on is a light implementation for listing all the supported Emojis in a toolbar panel. Since now a days browsers supports many Emojis, usually the toolbar panel takes sometime to fully load all these Emojis. In this extension having an acceptable loading time was the main motivation. Despite other extensions of the same kind, in this add-on the UI is loaded and then list of Emojis are updated. This way the panel is accessible as soon as user clicks on the toolbar button without any delay. How can I copy the selected Emojis? Simply use the searchbox or left side categories to find your Emojis. Click the one you need to copy. You will notice a list of clicked Emojis are avaaible in a text-box on the bottom of the panel. Note that you can change the position of cursor to paste a new emoji at a place you would like. Also you can delete or add text content. When you are done, click on the copy button to have the list of Emojis in your OS clipboard. This list can be pasted on any HTML5 supported text fields. It can even be used in an external application like your email client if HTML5 support is on. Can I increase the number of recent Emojis saved by the extension? Yes, open the panel and click on the gear icon to head to the options page. You will have an option to adjust the number of Emojis that are being recorded. If you do not want to have history you can turn it off here. Can I decrease the icon size of the panel? Yes, head to the options page. There are three possible modes for icon size. Basically the extension changes the font size of the panel based on this setting. Note that Emojis are actually part of browser font and their size should be equal to other inserted characters. Why does the panel look different in different browser? In "Emoji Finder" extension, the actual font that is rendered by browser is displayed in the panel area. This is intentional to give you a preview that is realistic. Some other extensions use custom emoji icons but since this is not actually the shape that other users are going to see, it might be deceiving. In "Emoji Finder" the actual browser rendered icons are displayed. So when you actually post these Emojis, you will see the exact same shape with only different font size. I found an Emoji that is not supported by "Emoji Finder" extension. How can I report this? Please open a bug report in the GitHub page or simply add a note in the in the comment section of this page. I installed the extension but cannot see some Emojis. Is there any solution? On Windows OS, some Emojis might not be supported; see http://caniemoji.com/microsoft-windows/ to see whether you Windows version supports all Emojis or not. 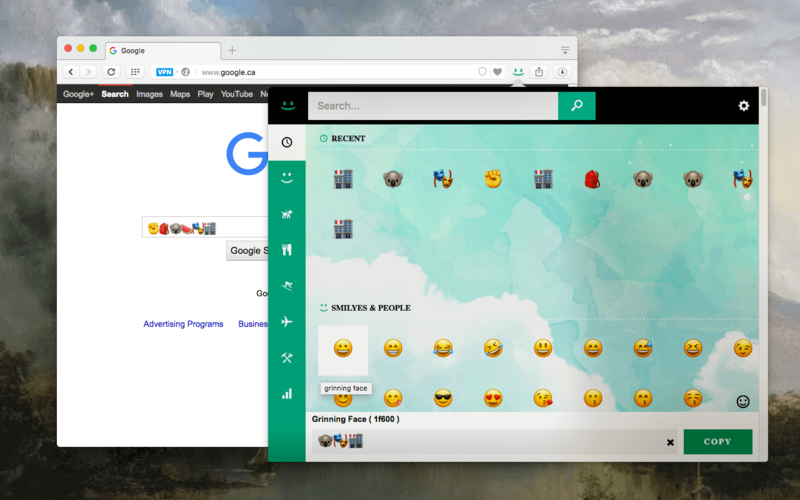 To extend emoji support of your Windows, you can get this update from support.microsoft.com.